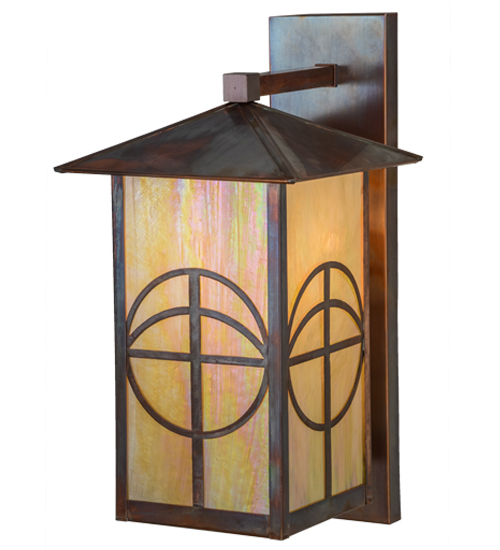 Description: Custom Crafted of Solid Brass, inspirational crosses intersect circular designs that are combined with a Mission styled profile featured in this handsome, yet unique American-made Craftsman Signature design. Ambient light projects through Beige Iridescent art glass enhanced with Vintage Copper finished hardware and frame. Ideal for indoor and outdoor lighting applications. Handmade by Meyda artisans in the Yorkville, NY manufacturing facility at the foothills of the Adirondack Mountains.